Peach Papaya Coconut Cream 60ml ejuice by Pachamama is the trifecta flavor blend of sweet peaches, papaya and creamy coconut. Manufactured by Charlie's Chalk Dust, Pachamama Peach Papaya Coconut Cream eliquid provides a fruity blend of juicy peaches & papaya on the inhale with tropical coconut cream on the exhale. Three fruits in one flavor, will make your taste buds feel like it's on a tropical island. Packaged in a 60ml eliquid bottle. Strawberry Guava Jackfruit 60ml ejuice by Pachamama is the flavor blend of sweet strawberry, juicy guava and refreshing jackfruit. 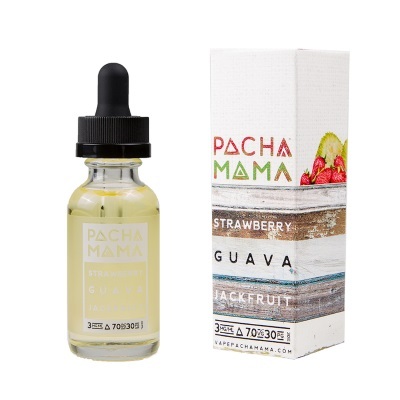 Manufactured by Charlie's Chalk Dust, Pachamama Strawberry Guava Jackfruit ejuice provides succulent strawberries on the inhale with a guava shining through and refreshing notes of jackfruit on the exhale. A true tropical flavor experience in a 60ml eliquid bottle.